To answer Raman’s question, I turn to Twitter timelines of Congress to show him pictures of Gandhi’s UAE visit. His urgency is palpable. It matters to him that it will be a while before he gets to see Gandhi on stage. He says he lives in Sharjah, and, in the absence of his own vehicle, got his son to drop him to the nearest metro. The long journey has been made in honour of two generations of his family who have been avid supporters of the Indian National Congress. He speaks of Indira Gandhi’s charisma, her astute leadership and how India has trumped the United States in having a female head of state. His memory has not edited out the Emergency or the 1984 riots, those have just assumed a peripheral status. Having moved to the UAE in late 70s, the India he remembers is frozen in time. Meeting a political leader, for Raman, is like replenishing that stock. Much of the three-hour-long programme is about building anticipation for Rahul Gandhi’s first official visit to the UAE. There are musical programmes and dance performances celebrating cultural diversity of India. For most part, the audience applauds. Occasionally, the frenzy intensifies as the TV screens put the spotlight on former chief minister of Kerala Oomen Chandy. Chants of ‘Bharat Mata Ki Jai’ can be heard too. Raman, who is otherwise restrained in his gestures, throws his hand up in the air when it comes to sloganeering. Is it important for him to chant ‘Bharat Mata Ki Jai’? No, he says. At this moment, it seems the slogan has risen above the clutches of Left and Right to stand for something larger than a patriotism test. It’s been two-and-a-half hours, but Rahul Gandhi is yet to be spotted. Building anticipation means also wondering what will he say that has not already been said. Exactly a week before, he mounted an attack on PM Narendra Modi and defence minister Nirmala Sitharaman on Rafale. Intolerance, rising unemployment, agrarian crisis, demonetisation, GST have all been key points of criticism against the ruling government. Can he really surprise an audience familiar with these narratives? The answer comes in the final 30 minutes when he makes an entry amid loud cheers. At the event themed Gandhi 150 Years: The Idea of India, he gives a speech that is an extension of Congress’ electoral campaign in India. “It’s the year of tolerance in the UAE, but back home, it has been four-and-a-half years of intolerance,” he says. The uncharacteristically husky voice, perhaps owing to a sore throat, was helpful; it added gravitas. Though he cannot spot Gandhi amid a bunch of well-built men who have decided to stand in front of him, Raman rises to clap. Gandhi proceeds to talk about unemployment, job creation, taking digs at the ruling government. It’s a tried-and-tested rhetoric that resonates because it is delivered evocatively. 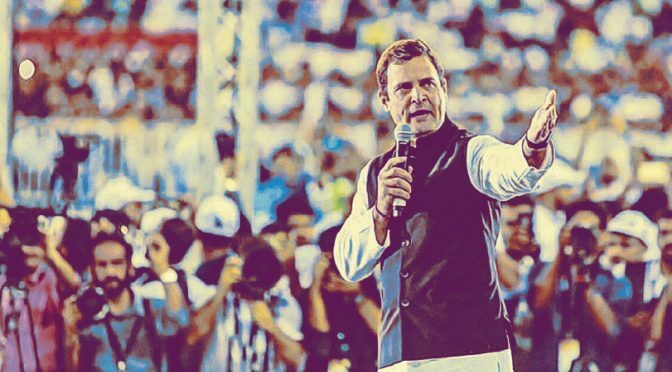 Rahul 2.0, as a section of the Indian press has dubbed him, is eloquent even in his irreverence. The issues raised are interspersed with a plea for greater participation of NRIs in Indian society and economy. It’s not a new trope, but a necessary one since the narratives revolving around NRIs are changing. While India continues to be the top recipient of remittances in the world (at approximately $80 billion for 2018; the World Bank), on the other hand, the demand for proxy voting for NRIs has been gaining momentum. Gandhi’s speech taps into those sentiments (in the rally, he even assures them a representation in Rajya Sabha). Given a majority of the audience hails from Kerala, I wonder if the Sabarimala issue would be touched upon. Expectedly, it isn’t, owing to the tinderbox the Indian temple has become. Having supported the Supreme Court’s lifting of the ban on all women entering the temple, the Congress is now more ambivalent in its position, perhaps owing to a vote bank that is opposed to the verdict. (A day later at a press conference, Gandhi addresses the issue). The curtains come down on the show with a promise of granting a special status to Andhra Pradesh. Gandhi, having ticked key talking points, is escorted out of the Dubai International Cricket Stadium. Following a queue of people walking towards the exit, Raman asks me, “Do you think he will win?” This time, there’s no Twitter to fall back on.